The Impact Awards are committed to creating an accessible space. If you require accessibility support at this event, requests can be served more effectively if notice is provided at least 10 days prior to the event. Direct accommodation requests to career.services@dal.ca and 902.494.3537. 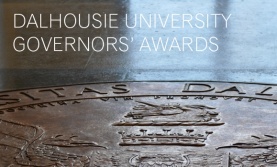 Every year, there are over 70 awards given to Dalhousie students and societies who demonstrate leadership, civic engagement, and exemplary contributions to the community. - Must be a current member of a residence hall community at Dalhousie. - Contributes to the life of the residence hall community. - Encourages and empowers residents to get involved in the wider community. - Promotes an atmosphere of respect. - Takes initiative in creating new opportunities for their peers. Student Life & Community Service - Contributes to the life of the Dalhousie, Halifax or greater communities. - Demonstrates personal values through action. - Creates or contributes to new initiatives that inspire others. - Contributes to a culture of student leadership and social responsibility. Academic Life - Involved outside of the classroom in faculty and/or student societies events and initiatives. - Encourages their peers to engage in faculty events. - Demonstrates passion for the discipline. - Takes initiative in creating new opportunities. Student Societies - DSU ratified society and/or club that demonstrates significant contributions and impact in the community. Graduating Students - Awarded to graduating students who are receiving an IMPACT award. Anyone can nominate a student or society for an IMPACT award and we encourage staff, faculty and students to submit nominations. You can even nominate yourself if you wanted to. Nominations open in December and close late February. Nominations are accepted for all Dalhousie students regardless of level or year of study provided they meet the specific criteria for each award. Nominations for the 2018-2019 Impact Awards are now closed. The deadline for this year's awards is Friday, February 8, 2019. When nominating an individual be as detailed as possible about a student's accomplishments and involvement and prove how they fit the award criteria. It may be helpful to talk with a student in person about their achievments to better inform your nomination. Please note: The Board of Governors' Awards have a separate nomination deadline of Friday, January 11, 2019. Find more information and nomination forms here. In addition to above, the following awards have additional criteria. The recipients of these awards are determined by the Dalhousie Student Union Impact Awards Selection Committee. Awarded to a student in good academic standing for each Dalhousie faculty. These students exemplify the highest level of passion for their discipline, take initiative in creating new opportunities and encourage their peers to engage in faculty initiatives. Faculty Leadership Award winners positively impact other students in their faculty and the reputation of their faculty at Dalhousie outside of the classroom. Presented to current members of each residence hall community who have made outstanding contributions to the life of their residence community, led by example by encouraging and empowring residents to get involved, promote respect and create opportunities for their peers. Awarded to current residence students in positions of leadership (such as a Resident Assistant) who have best demonstrated an exceptional level of maturity and professionalism. They encourage and empower students to engage in student life, they lead by example and work to improve the life of the residence hall. Awarded to a student who has demonstrated excellence in generating an innovative idea, concept, or business. The student uses their leadership, vision, and focus to make their ideas come to fruition. This award recognizes an outstanding off campus student leader who has demonstrated significant leadership, commitment and service aimed at improving the community they live in. Awarded to a student who demonstrates passion and commitment to social justice and action, and who leads by example, organizes students in an inclusive way, acts with integrity, raises awareness, and inspires others to create change. Awarded to a student who has made a significant contribution to improving awareness on sustainability issues at Dalhousie. This person's actions reflect their passion for the environment and inspire others to make positive change. Awarded to an International Student who has demonstrated excellence in leadership, shown engagement in the community, inspired others and is a respected voice for international students at Dalhousie. Awarded by the Dalhousie Student Union to the Councillor who has demonstrated a commitment to collaborative problem solving, active representation of their constituency, and initiative in the pursuit of innovation. Awarded to first, second, and third year students who have demonstrated an outstanding level of commitment, leadership, creativity, and initiative to the DSU, as well as to the campus and community at large. Awarded to the King’s student who is most highly engaged and takes on a leadership role at Dalhousie. This is the sister award to the KSU Community Engagement Award for Dalhousie students at King’s which acknowledges the contribution of a Dalhousie student to the community at King’s College. To be eligible, students must have a minimum cumulative GPA of 3.0 or equivalent. Otherwise, all students - undergraduate, graduate or professional faculty student, full or part-time, at any stage in their academic career - may be considered for an award. Awarded to a Dalhousie varsity student-athlete who demonstrates significant contribution to the community, has increased awareness at Dalhousie of a given charity or cause and demonstrates positive leadership and inspires others to get involved. Awarded to a Dalhousie intramural or sports club participant who demonstrates significant commitment to Dalhousie's intramural or sports club programs, exemplifies the role of intramurals and/or sports clubs in developing and promoting student engagement and fun on campus and demonstrates positive leadership and inspires others to get involved. Presented to a student employee who has demonstrated leadership and fostered community spirit in their work on campus. This student will be employed in any capacity on campus and through their work, contribute to the Dalhousie student experience. Awarded to Dalhousie students to recognize an elite level of involvement and achievement in campus life over the course of their university career. These students have shown outstanding extracurricular contributions in the community. Awarded to a student for an elite level of involvement and achievement in campus life over the course of a university career. This student has shown an elite level of consistent campus involvement over the course of their university career and has made outstanding and impactful extracurricular contributions in the community, be that through student advocacy, academic justice, leadership or other student involvement. The award was based off of the academic and community accomplishments of Dalhousie alumni Level Chan, Malcolm Honour, and Lilli Ju. Awarded to a Type 1 Levied Student Society ratified with the Dalhousie Student Union that has demonstrated consistency in planning and delivery of programming or events, high student participation and attendance of their membership and sets an example for other student societies. Awarded to a student society ratified with the DSU that has made a significant contribution to a charitable cause, within the Dalhousie community or beyond. The society has demonstrated consistency in planning and delivery of programming or events, high student participation and attendance of its membership, and sets an example for other student societies. Awarded to a faculty or departmental society ratified with the DSU that has best demonstrated consistency in planning and delivery of programming or events, high student participation and attendance of its membership, and sets an example for other student societies. Presented to a student society ratified with the DSU that has raised awareness, engaged students, and increased representation of a culture, religion, or spirituality on campus. It demonstrates consistency in event planning and delivery, high participation and attendance of its membership, and sets an example for other student societies. Awarded to a Student Sports Society, Club, or intramural league. The Society must demonstrate consistency in planning and delivery of programming or events, high student participation and attendance of their membership and sets an example for other student societies. Awarded to a Student Society ratified with the Dalhousie Student Union that caters to the general or niche interests of students, and has demonstrated consistency in planning and delivery of programming or events, high student participation and attendance of their membership and sets an example for other student societies. Awarded to the residence council that has demonstrated consistency in event planning and delivery, has high participation and attendance of their membership and sets an example for other councils. This council also acts as a strong advocate for the individuals it serves. The Alumni Distinction Award is presented to all graduating students who are receiving Impact Awards. These award recipients will receive the opportunity to be Alumni Ambassadors within all Dalhousie Alumni Chapters around the world, which will provide the opportunity to stay connected to Dalhousie and to continue making exemplary contributions to their communities. Up to four students are selected for a Board of Governors' Award each year, for their exceptional contributions or leadership in the extracurricular realm. Awards are presented at the IMPACT Award ceremony. Nominations require a separate process than the IMPACT awards. Visit dal.ca/governorsawards for more information. The deadline for nominations is January 11, 2019. The DSU Honours Awards Committee is responsible for reviewing nominations and selecting recipients. Once the winners have been selected, they are notified by email and have pre-allocated seats to ensure they can attend the awards ceremony.